Back in December, we took delivery of one of Swobo’s newest creations: The Baxter. The striking form and stellar fit-and-finish should come as no surprise. It was planned and laid out by Sky Yeager, a renowned bike designer. Now it’s time for me to talk about my adventures. My very first impression? The bike itself feels a bit like a fast cruiser bike. I like it. A LOT. This snow would set the pace for the vast majority of my trial run with the Baxter. With 700×28 tires, I was just a little concerned. The first morning out, I decided I should probably ride to the bus stop, which is about a 3 mile ride for me. The upright position is great. You are up and above most compact cars on the road. You’re aware of everything around you, and the surprisingly bright, pulsating integrated seat-post tail light meant that I was getting a whole lane to myself in the dark, wee hours of morning. For short trips under street lights, I use a Blackburn Flea on strobe mode as my only headlight. It was my only accessory for the first few days. With just a little snow on the ground but more in the forecast, I decided that I’d ride the Baxter all the way home from work without the bus, a trip of about 15 miles. It had warmed up to 19 degrees, and I have ridden the whole trip in far colder. With my backpack stuffed full of extra layers from the 3*F morning commute, I had a significant load on my back. The upright position is pretty much non-negotiable. 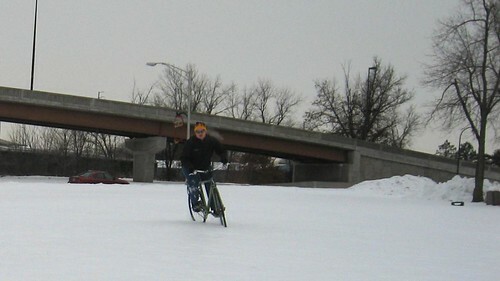 A stiff and cold headwind meant slow speeds, dry eyes and windburn, but some shallow snow was enjoyed! Let me make this pretty clear. I’ve tried riding that distance (at speed, in traffic) on my wife’s Electra Townie before. While the Baxter isn’t quite a “beach cruiser” like the Townie, both bikes force you to ride upright. This is usually a recipe for disaster on longer, quicker-paced rides. 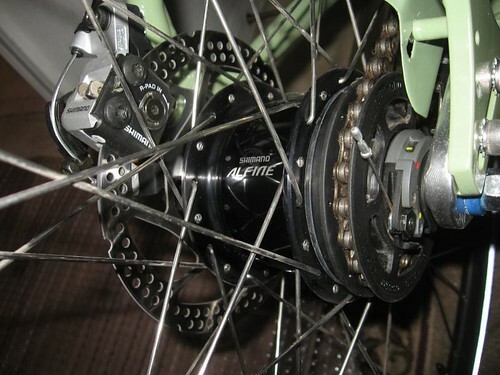 The Baxter comes with an Alfine hub, which shifts smoother, doesn’t complain when you shift it under a load, and overall feels a lot more sturdy than the Nexus internally-geared hubs I’ve used in the past. It handles somewhat aggressive riding, shifting while out-of-saddle hill-climbing and other abuse very well. On my long commute, this was a welcome feature. In Urban Kansas City with all its hills, the 8-speed gearbox was also a life-saver. It’s worth noting that this is the second most expensive part of the bike next to the frame. Buying a wheel laced to an 8-speed Alfine would cost as much as a whole entry-level bicycle at a reputable shop, so it most certainly contributes greatly to the Baxter’s $1099 MSRP. It’s also worth every penny. The only maintenance I performed in a month and a half of riding salty, slushy grime was a periodic wipe-down of the bike and re-lubrication of the chain. Even at near-zero temperatures, shifting was precise and predictable. First gear is good for climbing, but it’s nowhere near as low as the lowest gears on my road bike or mountain bike (both with triple cranks). The highest gear (97 gear inches by my calculations) is plenty higher than my mountain bike (84 gear inches), but doesn’t hold a candle to my road bike’s massive 52×12 top gear (114 gear inches). 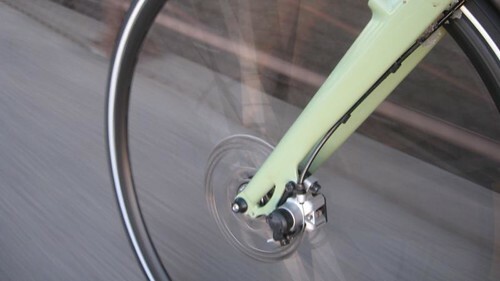 The Baxter should go well over 25 MPH at 100 RPM cadence in its top gear, but given the wind resistance of sitting bolt upright, that seems terribly generous unless you have a great tailwind or a long downhill journey. The next thing I did was try to test-fit my Cascadia fenders and Sun-Lite rack. This is where things got a little tricky, requiring some of the oddball hardware that came with the fenders to move the fender-stays away from the massive disc-brake calipers. A few washers here, a long bolt there, and things finally came together. Add-ons aren’t quite as straight-forward when you’re dealing with disc brakes, but any bike shop should be able to help you get these accessories installed if you can’t figure it out. One thing Sky did when designing the frame was include copious amounts of eyelets for things, including separate eyelets in the rear for a fender and rack and accomodations for two water bottle cages. Urban errands were definitely taken into consideration with this bike. With the slow speeds, slush and snow, I didn’t feel like dealing with the fenders. They’d just clog up. I left the rack on for the duration of my test, though, and used the spring-clip to hold a mud-guard in place. 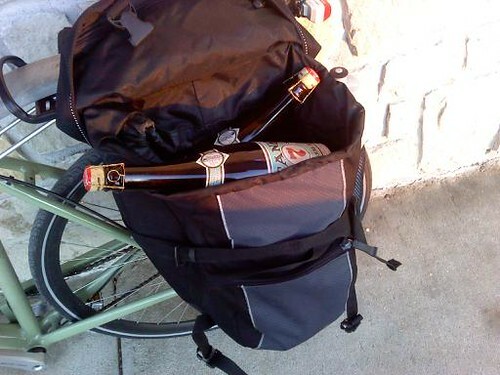 Really, I’m a pannier guy at heart. This was my first time riding a bike with disc brakes more than a few miles. I certainly appreciated the pizza cutters in the weather conditions we had. As expected, they stop the bike promptly, but they’re not overbearing, even in horrible, slippery slush. … until the snow got more than two-to-three inches deep. Then, the bike gets buried. Note those bright, reflective sidewalls. This photo, unlike most, was taking with my phone and the light reflecting off the tires is from the tiny LED “flash” on my phone. On a side note, I’m not sure that even a purpose-built snow bike would have gotten me through this stuff very easily, as deep and loosely packed as it was. I had to walk a ways after taking this pic. The Baxter was absolutely perfect for my usual winter multi-mode commute, where I use the bus and bike combined to get around town. For short errands and rides of under 5 miles, the Baxter is an awesome ride. It’s versatile enough for daily use, pretty enough to show off to your friends, and an absolute blast to ride. Everywhere I went, I got comments about it. I used the Baxter every single work day of my test period, well, at least until January 8th when I got laid off. When I got home, I used the very clever built-in bottle opener under the saddle to crack open a cold one before beginning the job hunt. Editorial by RL Policar: The Swobo Baxter is considered a DEMO bike, meaning it will be going back to Swobo once testing has been completed. Twenty-five mph on an upright bike is pushing it. IMHO they are intended primarily for speeds in the 15mph range. The Green Wave in Copenhagen (IIRC) is set for an average speed of 20 kph(15 mph). For head winds the Dutch are famous for installing clip on time trial bars on their upright bikes. Nothing like seeing a Oma bike with those on there. The handlebars look low to me on the Baxter, but that may just be my preference for an upright riding postion. It does look like Swobo and some others are finally starting to build bikes for “the rest of us”. Noah — excellent review. You got to test it in some harrowing conditions, too. Nice work! I think Swobo has had its finger on the pulse for a while now. Sky is definitely no dummy…she has an uncanny knack to develop bikes that are perfect for the prevailing currents in the industry (sometimes she’s even ahead of the curve — think “Pista”). I like seeing the very commuter-friendly features on this bike — a seamless blend of stylish looks and total practicality. Stock color-matched fenders would be a nice touch, of course. I’m wondering if there is clearance for wider tires with fenders. Hard to tell from your photos, but it looks a bit tight at the chainstays. 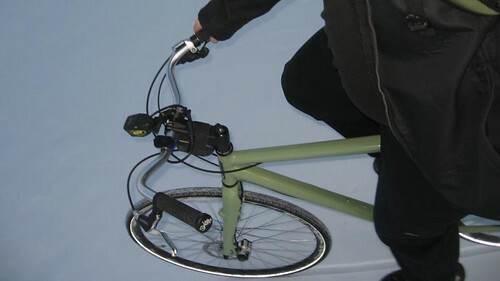 I think an urban commuter (especially one w/ a relaxed, upright riding position) should be able to take at least 700×32 tires w/fenders fitted, and ideally 700 x35 plus w/fenders — if you live in ice and snow country (also usually pothole country) having the option for wider tires is nearly essential — and if you ever wanted to fit studded tires you will be hard pressed to find them in skinny sizes. The chainguard is a nice touch, fenders would be a good addition. Not sure about the aesthetics of that oversized downtube — looks sort of clunky, but YMMV, of course! The downtube is a hexagon, and the whole bike is surprisingly light for how bulky the frame looks. As for running wider tires with fenders, I think the main hang-up will be the fork, which is carbon fiber. It fits the fender just fine, but I’m not sure I’d want anything much wider on the wheel, at least with fenders installed. The chainguard is probably the feature I’ll miss the most. That rack is a sun-lite adjustable rack, and I moved it over from my road bike (my usual fair-weather commuter) without making many adjustments to the rack before putting it on. I bought REI’s fusion last fall. They sound kind of similar. The Alfine hub has been a dream. I was a little worried with only eight gears, but it has held up fine. Disc brakes are great in the rain and snow. It also comes with the same tires. Nothing more than the typical issues when dealing with four inches of snow. 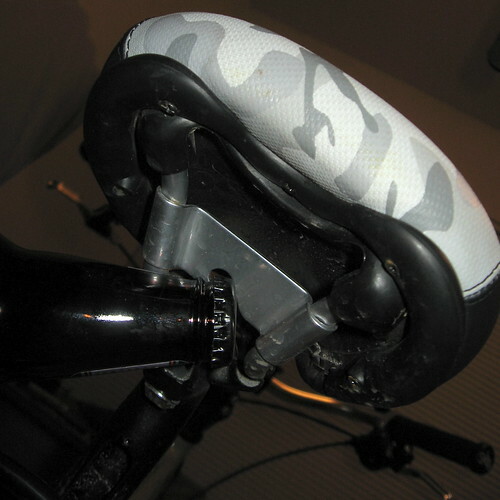 The upright riding position was an adjustment, but I have gotten used to it now. I used to be frustrated at working so hard to hit 15 mph. Now I accept that this bike is just slower. I don’t worry about my speed and enjoy the ride. I would love to have a bottle opener on my ride, but I am not giving up my Flyer. The Novara Fusion does look good — for $200 less than the Baxter you get a similar setup, but with 32c tires, fenders and a rack installed, plus a dynamo light(with dual beams, no less!) and a photo and motion sensitive taillight– so the taillight will automatically come on when it is dim out and you are moving. Pretty sweet! The baxter does have a nicer chain guard, though– the fusion only has a ring guard. 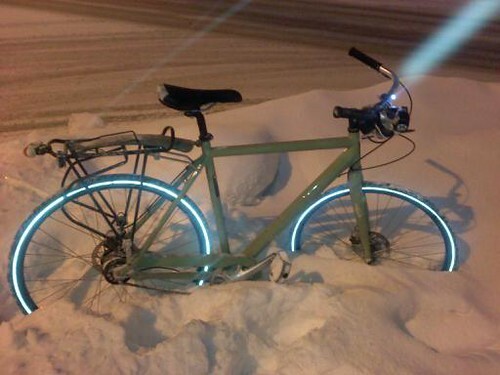 The recent snow has driven me from my car and onto my bike this bike would certainly keep me on one. Ugh, another potentially great commuter ruined by crabon fiber. I read your disclaimer for the articles on the RANS and this Swobo. I think it would be nice and clear for you to put up at the top of each review a clear statement of how you received the product for review. That might go above and beyond the mandated regulations, but it would add to your image of being transparent, acknowledging any conflict of interest you have. Getting products free for review is just a bit different than paying for them. I love the reviews, though, so keep them coming. I hear ya, we’ll make sure we make the changes. But the Rans and the Swobo are “demo” bikes, meaning they go back to the company once we’re done with them. I don’t know of any manufacturer that just lets you keep the bike. It hasn’t happened to me yet. It’s common to let people in the industry borrow a bike for 4-8 weeks. In this case, the Baxter I reviewed was shipped out to one of Swobo’s first Baxter customers, whereupon the shipping company caused superficial damage. It was returned to Swobo to become one of their demo bikes, since it’ll be hard to sell it. Either way, I shipped this bike back to Swobo HQ in California a few days ago, and I’m back to riding my normal commuter bike until it’s time to test the next fun toy that’s sent my way. Most of the products sent to us for review that have an MSRP of under $50, the manufacturer or distributor doesn’t want it back. This doesn’t guarantee a favorable review, for example: by trumping up the features, or by ignoring the products weaknesses. As a matter of fact, probably 70% of the stuff I review is stuff I paid full retail price for, at the same kinds of places our readers would shop. 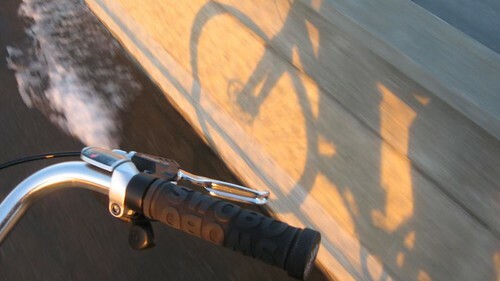 We all have real jobs (except for me, I’m laid off for the time being) and we commute by bike. We don’t get paid to write here, and the advertisements are to cover the cost of keeping the lights on and the website up. It’s a labor of love for all of us. We share our experiences with the community and we listen to the advice and input from our readers, who are gracious enough to also give plenty of good advice as well. We just want people to bike their drive! On this disclaimer business, I think we are all over-reacting… are we all becoming lawyers? Take the reviews for what they are worth – products either purchased by the awesome site authors or provided as a demo by manufacturers. Why would anyone doubt the goodwill of the author? We are talking about a relatively small group of people who read this site assiduously, we all know the background of the authors. Oh, and nice review, by the way. Oh well, happy commutes! @Pete — we’re running scared of the new U.S. Federal Trade Commission guidelines concerning product reviews…the guidelines are rather sparse, but the penalties are HUGE ($10K per offense). So, we’d rather not find out the hard way that we are doing something wrong — thus our over-reaction. 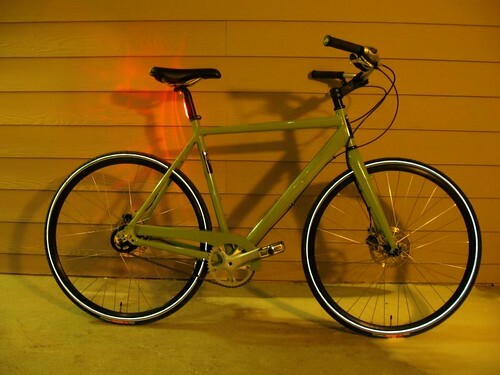 I am looking for a commuter for 20 mile per day round trip here in southern California and ran across your review. How would these tires and this set up for that matter hold up to a 260lb man? You mentioned 5 mile comfort level and upright riding I wonder if I could strecth to 10 miles each way with no problem, paved bike trails. The tires are great for that kind of thing. You can try. Your question borders on the “what kind of bike do I want?” and that’s something you can answer only for yourself. It’s largely personal preference. I’d personally prefer mountain bike flat-bars or road bike bars for a distance that long. Those allow you to shift some of your weight to your shoulders and arms, and allow you to “tuck” a bit. I’ve ridden plenty further than century rides on mountain bikes with nice, narrow tires that roll easily. That same bike was my daily commuter for 150 miles per week as well. It can be done. I just wasn’t feeling it with the swept-back cruiser bars. I consider 10 miles about the upper range for an upright commuter, my longest regular commuter ever was 12 miles one way. I rode a Raleigh Sports or a Motobecane Nomade the Nomade was a drop bar bike and the commute was maybe 5 minutes quicker on it. FWIW my average time for the 12 miles was right around 40 minutes. I have been riding mountain bike with fat nobby tires so maybe I just convert to road tires, although there are some really nice bikes out there. Wonder what would be good for me in this application – daily commuter, 8.5 miles each way. Thanks for the repsponses above, would appreciate any direction for say a budget of $1000. I’ve long believed that a sturdy mountain bike makes an ideal starter platform for a great commuter bike — especially older models that have all the braze-ons for racks and fenders. I’ve got a 20 mile round trip commute over a coastal plain (flat and windy) and I’m a 260 lb rider. I’ve found that putting north road bars (similar to the Baxter) on my flat bar bike has 1. increased wind resistance a bit and 2. improved my comfort level on the bike immensely. The second point is much more important to me has made my commute really enjoyable. So I suggest swapping out for road tires to make for easier rolling and try out a cheap pair of North Road style bars and see if you like ’em. I’ve got a 20 mile round trip commute over a coastal plain (flat and windy) and I’m a 260 lb rider. I’ve found that putting north road bars (similar to the Baxter) on my flat bar bike has 1. increased wind resistance a bit and 2. improved my comfort level on the bike immensely. The second point is much more important to me and has made my commute really enjoyable. O Lord, I’ve been a victim of a double post! Quick, someone find an administrator before anyone sees it! Help! Thank you Ghost Rider and Graham. Nice article, thanks for pointing me to it, now the only problem will be what to do with the $1200 burning a whole in my pocket, really got set on buying the Swobo Baxter, but your right I will start with tires, and my flatbars hurt my arms, elbows and shoulders so maybe I will also lower the seat a tad, we will see. Do you know weight of Swobo Baxter?